New Year’s Eve on Copacabana Beach in Rio de Janeiro is HUGE. How huge? Maybe 1-2 million people descend on the area. The streets on the beach and leading up to it are closed to vehicle traffic, and it was really nice to see police presence everywhere. I was somewhat disappointed by the shift away from the evening’s original afro-spiritual roots. Last time I was in Rio, New Year’s eve was the time that those of African derived religions (usually mashups with Christian beliefs) made offerings to Iemanja, the goddess of the oceans. They brought flowers, candles, small boats with fruit and cachaça (rum) to the edge of the ocean. Originally, the poor prayed for Iemanja to yield up her fish so they could eat. That tradition spread so that everyone, even if they were not in one of those religions, brought the Goddess gifts and prayed for health, prosperity, love or whatever they thought they needed. Everyone at the beach wore all white as far as the eye could see. It was an emotional and moving event that inspired me to write a poem about it. Things change. It’s become just another New Year’s gathering. 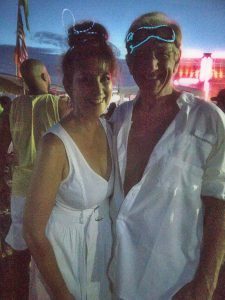 So few people wear white that a news photographer on the beach stopped Deena and I and asked to take our picture. We think we were the only two people he could find wearing all white! In spite of losing its spiritual roots, Copacabana still remains one of the most special and unique New Year’s Eve experiences in the world. 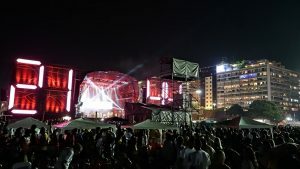 The city sets up three huge stages with big name entertainment that runs from sunset until the wee hours of the morning, all free. The first trick, especially for those of us spending leveraged money (the US dollar is 4-to-1 now), is to buy a spot in a barraca (pronounced ba-ha-ka). During the day, these concessionaires on the beach sell everything from drinks to food, and rent umbrellas and chairs. On New Year’s Eve, they are allowed to rope off a section of beach around their licensed stand. Buying a place inside keeps you from getting crushed by the millions. Because we reserved early and didn’t bother to negotiate, we surely paid more than most. No matter. We had comfy beach chairs facing the main stage under a pop-up shelter in case of rain. We also had our own waiter and, for the price, drank caipirinhas all night while they kept our bottles of champagne on ice. We even had our own body guard who escorted us to the road through the crowds when we left. Sometimes, it’s good to be king! The entertainment all night was fabulous. There was a special show on to commemorate 100 years of Samba. The headliner on the main stage was Jorge Ben Jor leading up to midnight. After the twenty minutes of fireworks, yes 20 minutes of fireworks!, there was more great music from Zeca Pagadinho. Here’s the next tip and perhaps the most important: Plan your journey to and from the beach in advance. We went to the beach early and had no problem getting an Uber. Coming home, though, was another story entirely. Apparently, Uber’s servers were so overloaded that the application didn’t work after midnight. Getting a regular cab was impossible. All the cab drivers were negotiating prices. We lived too close for them to even talk to us. We couldn’t use the metro because our regular metro card didn’t work. We didn’t realize that we had to buy a “special” card for New Year’s Eve. It would have been smart to pre-hire a driver to pick us up. Lesson learned. We’ll do that for Carnival.